As I write this article I am sitting at Starbucks, and sipping on a Grande Pikes Place with no cream or sugar. Today I had no reason to stop at this particular Starbucks. Plainly put, it was a want. I was on my way to training this morning, and I wanted to grab some coffee and work on my blog post. So Starbucks seemed like the ideal place to stop. Free Wifi – question for you? Would you go to Starbucks if there wasn’t free internet? I’d assume about 30-50% of people that drink their coffee at Starbucks do so to surf the internet. It can be a great place just to unwind, surf the web, write blog posts ( ;) ), or conduct business in front of a laptop. Again it’s just another reason to get customers in the door, and to stay a while. Atmosphere – have you ever visited a Walmart, and then went into Whole Foods and just observed customers and clerks body language and attitudes? Big difference between the two environments if you ask me. People at Whole Foods like being there…in the same context when you visit Starbucks you notice people are genuinally happy to be there too. Both from a customer and clerk perspective. Again, it all contributes to the customers experience and attractiveness of Starbucks. Good Coffee – at the premise of why people come to Starbucks is their good coffee. For me – and I’m not getting paid to say this – Starbucks has the best coffee. Believe me, I’d much rather go to McDonalds and buy a coffee at half the price, but it really doesn’t taste the same. I know this quantified cost is completely subjective, but really when you buy Starbucks coffee you are paying for that status symbol and atmosphere. So there are just a few of the reasons of how I think Starbucks lures in customers. 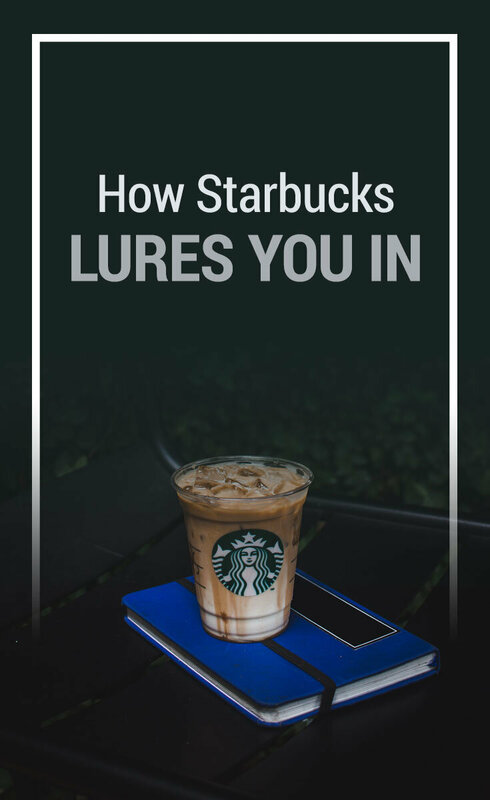 How do you think Starbucks lures in customers? Do you visit Starbucks? Why or why not? I go to Starbucks for one thing only. A double chocolate brownie to go. Love them and have an ongoing battle to ration those calories. The coffee smell is divine though and makes a nice mix. @Jennifer – that is really interesting. Do you know if Starbucks has ever thought about making a cologne? Fudge, and I went to Starbucks this morning for a Strawberries & Creme…I wonder if I was lured in like a naive little lamb now. I worked for Starbucks for several years, and I can tell you that the company works its collective tail off to ensure that customers have lots of unconscious cues to draw them further into a store. The classic example was when Starbucks first rolled out hot breakfast sandwiches a few years ago — and wound up completely renovating ovens, because the smell of the cheese in the sandwiches was competing with the coffee aroma!